Nimbin HEMP (Help End Marijuana Prohibition) categorically refuses to comment on the rumour that the Big Joint will be used to light the Olympic Cauldron at the opening ceremony of the 2000 Games in Sydney. Spokesperson for the organisation, Mr.Michael Balderstone, called upon all Australians to respect the need for secrecy and security around SOCOG's choice for the method of lighting up the Olympic games. "It's a complete coincidence that the Big Joint is leaving Nimbin for Sydney this week", he said. "Law reform activists are meeting in Sydney for two important events; the culmination of the Freedom Ride Tour of NSW prisons at Long Bay Jail on Father's Day and the inaugural Sydney Hemp Olympix on September 9". "The so called- Drug Free Olympics is not at the top of our agenda but of course, if we are chosen, we can probably swing back into Sydney for the ceremony. Our application for consideration was based on the Big Joint as a symbol of change. Its message is that we will no longer tolerate laws that cause social injustice"
HEMP agrees that cannabis prohibition is not the only area where the law discriminates against victims and also perpetrates more serious crime than it solves. "The law and order approach to social control fails over and over again. If we win the bid to light up Sydney it will herald a new era of sensitive and sensible approaches to social realities"
Claims that ASIO officers posing as undercover drug cops have been staking out the construction of the 15 metre joint, have not been denied. "We are the most highly policed village in the whole of Australia and the streets are filled daily with cops dressed up as tourists, locals, heroin addicts and the occasional old hippie" said Mr. Balderstone. "Cannabis prohibition has created a monster in Nimbin and all over Australia and it's time Australia's 5 million Cannabis users stood up for change". Big Joint on Sydney Harbour. Thursday 7 September and the Nimbin HEMP Embassy's 14 meter Big Joint looked elegantly long and thin as it lay upon the roof of the former Sydney Harbour ferry, MV Mulguy (renamed for the occasion the Mull-up-guys). Smoke puffed out of it and, to viewers in the high rise offices and residential units past which it cruised, the Big Joint offered a Nimbinesque invitation. 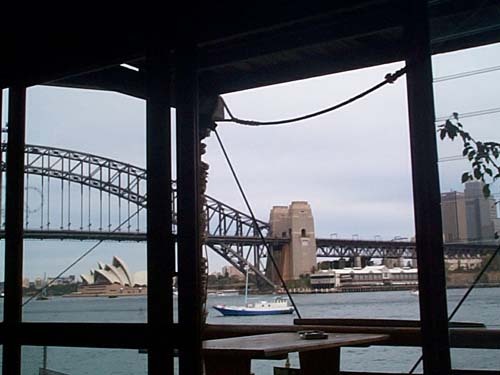 In the scale of the mighty Harbour Bridge and glass towers of the Sydney skyline, it was a wee joint of the kind a thoughtful and subversive hostess might lay on the dinner table as an unspoken invitation to a guest to lighten up. Here was political message as myth making high art. 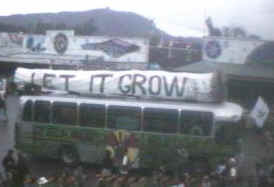 Along its sides a peace dove bearing a cannabis leaf trailed brightly painted slogans: "LET IT GROW!" on one side "THE LAW IS THE CRIME" on the other. The Big Joint is the central icon of Nimbin's annual hemp harvest festival and the "Let It Grow" Mardi Grass Parade in which it is born down the main street by an exuberant mob of 30 or so volunteers. Traditionally it pauses along the way to make a call at the door of the Nimbin Police Station, a salute to Bob Hopkins who on April Fools Day 1992 went to that door dressed as a jester, and in the witness of then solicitor, now magistrate, David Heilpern, and the local TV news cameras, smoked a joint. The action got Bob remanded in custody in Grafton Jail for two weeks and added rocket fuel to the fire of cannabis law reform in Nimbin. The Big Joint has many fans. It is play power guffawing, and wahoo at its wackiest. In a crowd its very presence brings laughter and smiles. Most of the year it hangs from the ceiling in the Nimbin HEMP Embassy but it also has adventures when it goes places to do things. In May 1999 when it headed to Sydney on the roof of the Cannabus to put cannabis law reform on the agenda of the NSW Drug Summit, it had most of Sydney laughing at its misadventures. The master of the MV Mulguy is Tony Spanos, curator of the Graffiti Hall of Fame, bane of South Sydney, and patron of the Aboriginal Tent Embassy in Victoria Park, Glebe. Tony was at the wheel demonstrating his driving skills and a small bunch of Nimbin folk sported themselves about the decks. Max Stone and Dave Cannabis circled taking photos from a yacht skippered by a former Sydney cannabis café proprietor. Lisa Yeates/Princess Anne, who had recently returned from Canada where she had performed as a guest of Cannabis Culture magazine at the Montreal International Hemp Festival, was there dressed in a glowing green silk suit and hat, and giving royal waves. Dressed in victory laurel and his joggers, satin, Oz-flag bedecked sports shorts, was Chibo Mertineit, who had returned a week before from cannabis law reform advocacy in Berlin? He carried the HEMP Olympix torch. From on board the "Mull up guys," the gigantic mass of the city was seemingly indifferent to our passage and our cause, however, the workers of Sydney Harbour, the commuters on the ferrys and ALL of the crews on the passing boats waved and smiled their support- including I might add the water police- some tourists around Pier One took some photos; the Sydney Daily Telegraph published a coloured photo for one early edition the next day so the folks back in Nimbin got to see it; and Radio MMM broadcast an interview. And at the end of the day, the Big Joint heaving to off Kirribilli House, the harbour-side Sydney residence of the Prime Minister, and providing a backdrop to the VIP garden party in progress there, is one of those stories that will be told and retold.